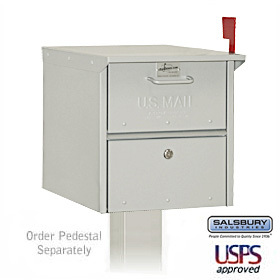 There are various types of residential mailboxes available to the consumer. Mail customers are allowed to decorate their boxes in any way so long as they meet the basic standards which the U.S. post office has established. They may be of the stand-alone variety or mount onto your house or front door. Some are little more than mail slots in a door while still other types of residential mailboxes are elaborate receptacles that add ambiance to the locale. It is always in your best interest when purchasing a mailbox to consider a locking type box to protect your mail from any thieves that may choose to help themselves, this comes with a recommendation from both the post office and law enforcements officials alike. Necessitating a key or other entry system, they secure the mail against prying eyes and hands, leaving it available to the addressee. These secure mailboxes are not the ugly ones of the past as they have now been developed to be visually appealing as well as functional. Avoid identity theft by your estranged spouse or a random criminal by making sure that your information is secure. In such cases, one spouse may become aware of the other one’s spying on them simply by the mail removed and sometimes returned only after being read. If you can, choose a mailbox that locks rather than a different type of mail box. The identity you save will be your own.